I'm going to share this with the Simon Says Stamp Wednesday challenge which is "something new." I hope everyone had a fun kick-off to the new year and thanks for the visit today as always! Have a great day! Wonderful card design and I love the varied colors you used on the horse. It makes it look fantastic that way. A beautiful card Carol, such a gorgeous image and great colouring. You painted this horse so well, Carol! Such great skills with so different colouring media!! And you also made a one layer CAS! :D Fabulous work with your new stamp! gorgeous image and perfect pencil colouring. Kudos on the one layer card - and it's fantastic!!! Love the coloring for different mediums. The image is so beautiful and regal looking. I love your blended colors, it makes him look so real. This should be framed and hung up. I adore the texture on this card! Great mixed media coloring! What a wonderful image, I love how you have coloured the horse, a fab card CArol. Beautifully colored, Carol. What a great image. Wowzers, what a great horse stamp! Love the sweet, gentle eyes! Awesome! 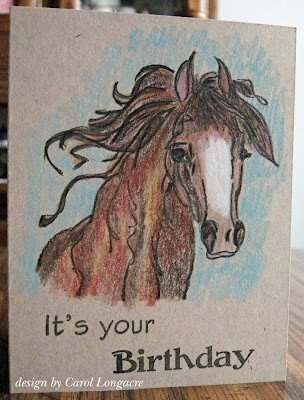 What a beautiful horse image, it makes a fabulous card.